PHP or ASP.Net: Which Platform Should You Choose? 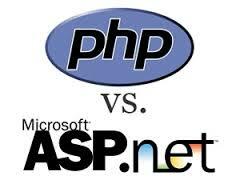 There is always a debate prevailing somewhere on the net over PHP and ASP.Net. The users of either of these platforms will vouch for it to the extent that they will come up with murderous charges on the other with regards to its performance, and scalability. There is no doubt on the fact that both the platforms have become successful ventures, and have provided great results for major websites tracking their ways on the internet. But the question still remains fresh, which platform should you choose when you start with website building exercise. As most of you, who have worked with either or both platforms, know that PHP is an open source platform while ASP. Net is a commercial platform, the comparison is basically between Apples and Oranges. But, unlike apples and oranges, there is some comparison factor present in these two platforms as they serve the same purpose. These two platforms would be compared based on their speed, performance, scalability, cost, support, maintenance and execution. Probably by the end of the journey, you would be aware of which platform best supports your needs for development purposes. This is quite a complicated comparison, the speed of a platform combined with its performance. When considering PHP or ASP Dot Net development, you need to make sure that the speed with which the server communicates as well as the speed with which the browser opens is good. There are three basic scenarios where speed of the platform is being tested. The first scenario occurs when the website tries communicating with the server. At this point, the backend database servers’ speed is tested and not the platform speed. But, when the web application tries to access the database file stored in the file system, it is actually using up the speed of the OS on which it is installed. While ASP.Net is restricted to Windows based platform, and max to max a Mac, PHP works over all the available operating system because it is open sourced. This is one tad bit of an advantage that PHP has over ASP.Net. Another speed and performance based advantage that PHP has over ASP.Net is when dealing with servers. It is a widely known fact that a Linux based server is not just fast but also quite efficient. On the other hand, a Windows based server is not quite a match. But when it comes to coding and running the code, no platform can match the speed and efficiency of ASP.Net. ASP.Net uses C# for coding which is known for ulterior speed combined with terrific performance. No wonder, the coding is one to be marveled at. Does a platform have anything to do with the efficiency your system develops to handle a large set of data? Well, not really! You can be indulging in ASP.Net or PHP development, and still manage to gain a scalable experience. The scalability of a platform completely depends on the use of benchmarked programming practices, experience and expertise with which the programmer uses the platform and the programming framework. Once all of these are developed, the programmer would get to his credit a pretty scalable performance that makes his platform a matter of envy. When you are developing a website using either of the two platforms, you have this question lingering on the back of your mind: which of the two platforms are definitely cost effective? There is a group that you would need to install in case you are considering either of the platforms. With PHP, your first group consists of My SQL Server, Linux OS, PostgreSQL Server and Apache server. This group and the upgrades available are all free. There is no additional cost involved. Even the licensing cost here is zero. The second group for PHP, also known as LAMP, includes Linux, Apache, MySQL and PHP. This group is quite popular, and has a substantial fee involved. But as against a Windows server, the Linux server optimizes less cost. ASP.Net on the other hand comes with Windows and IIS. Though ASP.Net and IIS as a group are free, Windows server adds to the cost. This licensing cost is substantial but there are chances of it increasing. When one talks of support, the LAMP module is open source, so a number of updates from developers across the world keeps it upgraded. The support for both PHP and LAMP are available along with the necessary resources. This is a more friendly and off guarded platform that helps you set up shop anytime with great amount of support and resources. While ASP.Net has sufficient resources, the support department is totally dependent on Microsoft and their developers. For even a minimal update, the platform is dependent on Microsoft. Though it is equipped with sufficient amount of resources, there is a lot of dependency in many ways for this platform. While PHP is platform independent, ASP.Net is very Windows dependent making Microsoft the key element. Juned Ghanchi is a contributing author for the 'corePHP' blog. Business technology news, views and insights. This entry was posted in PHP on September 23, 2014 by Juned Ghanchi.